We had a great rainy March. Now everything is green and fresh and blooming. I enjoy wearing my favorite perfumes and try to do it almost every day. I decided for myself that it didn’t make any sense to keep testing new perfumes in the search for a new love if I do not use those that I love already. I tried to be good with my New Year resolutions but I think I’m failing: I bought two bottles of perfume. And though one of them (Samsara EdT by Guerlain) was during the The smell good do good charity sale at Scents of Self and the second one probably doesn’t count since I’ve already split it (I still have 5 ml of Une Rose Vermeille by Tauer Perfumes to share at cost – send me an e-mail if you’re interested), I still feel I’ll have to increase my yearly FB quota. Also, I realized that even though I wear perfume every day I do not get too many acknowledgements. I do not know if I’m constantly under-applying and nobody can smell it or if I choose perfumes that people do not like and they are being polite by keeping it to themselves but results are the same (or at least it feels like that). Starting this month I record when I get a reaction to the perfume I’m wearing (both positive and negative – see the chart below). Wnen was the last time anybody complimented you on the perfume you were wearing? Do you remember the last complaint? I never received a complaint, thank God! I would take it to heart, I’m so touchy. Not very many compliments either, but sometimes they come and I treasure them. 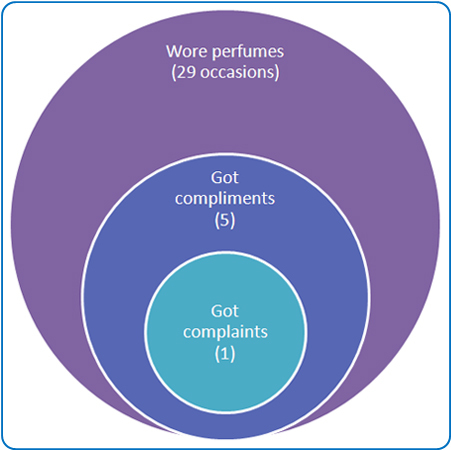 I’m glad to report that two people who had complained about my perfumes are also being consistent: one doesn’t like any perfumes and the second one doesn’t like ambers and gourmands. Ooh that’ll be really interesting to record your compliments. I do suggest an extra spray though to make sure people can smell it. Knowing your taste in perfume, I honestly don’t think the lack of compliments is because people don’t like it (except maybe that one odd guy you work with), just because you are a subtle sprayer. My mother complimented me on my sillage last weekend. I was wearing SL’s Sarrasins which is good in warm weather. It was 20C last week and 10C this week. Sigh. Should have said, I’ve never got a complaint, so far anyway! I’m documenting everything! Including comments :) I’m very curious to see if there are any dependencies on the type of perfumes I wear, time of the year, etc. About two months ago, my colleague complimented me on my SOTD: Habanita, one of my top five favorites. Equally about four years ago, the same colleague commented my SOTD: saying it smelt ‘old’ and ‘dusty’. I was wearing one of my top five favorites then, too, – Habanita. I didn’t have a chance to try Habanita yet so I can’t comment on either of those adjectives. But I’m curious: was it the same concentration? Was it the same formulation? To the best of my knowledge, both were identical in concentration and formulation: EdT in the black splash bottle. If it had turned or had undergone a significant formulation change, I’m thinking, I’d have noticed on the spot. However, between both comments, my colleague became a mom! I think, but I have heard, but don’t know if this is valid, motherhood can bring about changes in taste etc. I haven’t tried any of the two you’ve mentioned but having tried other Montale’s perfumes I imagine that it might be a challenging one for the polite-office-scents environment. No complaints, thank goodness. However, one of my co-workers asked me to tell another co-worker that her perfume “stinks”. I don’t agree; I think she smells lovely. She does like her patchouli! My vSO compliments my perfumes sometimes (though, not too often since he doesn’t smell most of them). I’d rather err on the cautious side: the smell you do not like (be it a perfume, food or even flowers) might ruin your day completely. So in the office, if we have to spend many hours close to each other, I’m prepared to take into the account reasonable requests of co-workers. OMG! Undina, you are practical. Evie will love the way you are trolling through perfumes. What a great way to structure something so amorphous, it’s a bit over my head. What I wanted to know wasn’t in your stats. Could you tell me your top 5 new scents this month and why, of the 25 first timers which one sang to you, which one was most FBW? I have so many questions. How is a wearing different to a test, the numbers are different? Sorry, you’ve made my head spin with interest. Thanks. Luckily I work with people in a boozy and relaxed atmosphere, there are loads of compliments and interest in the current perfume. The guys also find it useful for shopping for spouses and TSO. At least once a week someone either compliments or asks if I think my fragrance would work on them or their partners. Let’s start with testing vs. wearing. For the testing I apply a perfume to one area on my arms easily available for the repetitive sniffing. But, most likely, I’m the only one who can smell it. I can test two, sometimes even more perfumes at the same time. When I wear a perfume I apply it to at least three-four points and usually I plan to spend at least 4-8 hours with the same scent so I’m prepared to re-apply if the original application wears off. So those numbers are completely separate sets: if I wear a perfume I do not test it and vice versa. Five perfumes I liked after the first 1-2 tries? Ambre Russe and Cuir Ottoman by Parfum d’Empire, Five O’Clock au Gingembre by Serge Lutens, Myrrhe et Délires by Guerlain and Plum by Mary Greenwell. Not sure about FB for any of them yet but definitely a decant-worth. You have given me much food for thought, thanks. I gave in and FB Cuir Ottoman and Ambre Russe recently. They sit there unopened calling my name. I am holding off the opening ceremony because I’m enjoying the suspense. Myrrhe et Délires by Guerlain is now on my list. Did I miss you telling us which perfumes got complimented?! Perfumes that got me compliments: Violet Blonde, Coromandel, Champs Elysées Parfum, Eau du Soir and Tiare. That list of compliment perfumes really surprises me, actually! Not because the perfumes aren’t nice, but because of these reasons: Violet Blonde doesn’t seem to have a lot of projection from my skin, Coromandel seems like something only weirdo fumeheads like (my husband is not a fan, anyway), Eau du Soir seems a bit polarizing, too. Champs Elysees and Tiare I can understand, actually. So maybe I spoke to soon. And what a great idea to log compliments on scents or comments generally. It is such an infrequent occurrence with me too to get any kind of reaction that I struggle to recall chapter and verse. Most recent criticism was of ELDO Rossy de Palma and that new one of theirs with ginger and a rice note the name of which escapes me – Mr Bonkers pronounced them both to be “fly spray”, based on a fresh application. I wonder, how many perfumes in my collection will fit that magic formula bergamot + some other citrus + rose + jasmine + ylang + iris + vanilla _ musk + sandalwood? I should probably build some sophisticated querying tool to answer those questions. Complaints are even more interesting to document! I’ll share some once I have a good collection. OMG data! Charts!! No time to write more now but I am so intrigued!